In July 1936, part of the Spanish Army rose in rebellion against the government of that young republic. What was expected to be no more than a short and relatively bloodless coup d’etat, degenerated instead into a fratricidal civil war that raged for almost three years. Within weeks of the outbreak of the war both sides began to receive support from abroad, in the form of military advisors, volunteers, weapons and troops from England, the USSR, France, Germany, Italy, the USA, Czechoslovakia, among many others. After the first few months of fighting, fought out by colonial-war-style militia columns, highly mobile but having scarce firepower, both armies evolved into large armies that fought a war characterized by late World War I tactics and early WW2 weaponry. In fact, the war of 1936-1939 became both a cockpit for the struggle of ideas of the 1930s as well as a test bed for some of the tactics and weapons that would be used in 1939-1945. 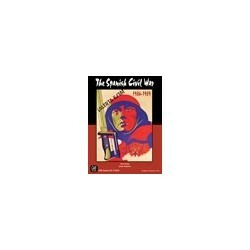 Many historians consider the Spanish Civil War as the first clash of the coming world war. The Spanish Civil War is a quick playing, moderately complex operational simulation of this war. Brigade-Divisional level, monthly turns for the first phase of the war and bimonthly turns from November 1936 until the end of the war. 480 1/2" counters and 1 big hex map. One grand campaign and multiple scenarios, including some What-if? scenarios speculating with WW2 beginning in September 1938 or a hypothetical Axis invasion of Spain and Portugal in 1941-42, complete with German Panzers, the Portuguese army, or British and Free French expeditionary forces. In TSCW, players play the roles of the military commanders of both sides: Generals Rojo for the Republicans and Franco for the Nationalists, with influence of politics and diplomatic events such as the Munich Agreement, the Anschluss, recognition of Franco’s regime by France or Great Britain, the withdrawal of the International Brigades, etc. etc. being handled using a The Great War in Europe-style chit system. The game system is based on the classic Igo-Ugo/movement-combat system, with the players having the possibility of achieving a “breakthrough” of the front, advancing after combat several hexes if they achieve overwhelming odds. The counter mix will include the international brigades (including the British-American-Canadian 15th “Lincoln-Washington”), the Italian CTV divisions, the German Kondor Legion (complete with aircraft, panzer and AA units), Republican guerrilla units, and a detailed order of battle of the columns of the first months of the war, including famous units such as the Durruti Anarchist column or the Army of Africa columns. Short scenarios (6-8 turns) can be played to completion in 2-3 hours, the full game is 19 turns long and can be finished in one sitting (approximately 8-9 hours).